This recipe is my own creation. I combined my love of bacon cheddar poppers with my love of mac and cheese. If you have never had bacon cheddar poppers, they are jalapeno peppers stuffed with cheddar cheese and wrapped with bacon. My daughter and I were looking forward to having them, but the garden didn’t turn out too good. So, not enough hot peppers to make any. I came up with this dish to give us the flavor. You will need a 2 quart oven safe casserole dish. Bring salted water to a boil in a large saucepan. Cook the macaroni about 8 minutes. Meanwhile, cook and crumble the bacon and seed and chop the peppers. After draining the macaroni, put the pan back on the stove. Over low heat, melt the butter. Add the flour, salt, pepper, dry mustard and onion. Stir in and raise the heat to medium. Cook, stirring constantly until the mixture begins to bubble. Keep stirring and cooking for about a minute. Take off heat and add the milk. Cook, stirring constantly, until the mixture thickens and bubbles. Lower the heat to low. Add 1 cup of the cheese and stir in until smooth and melted. 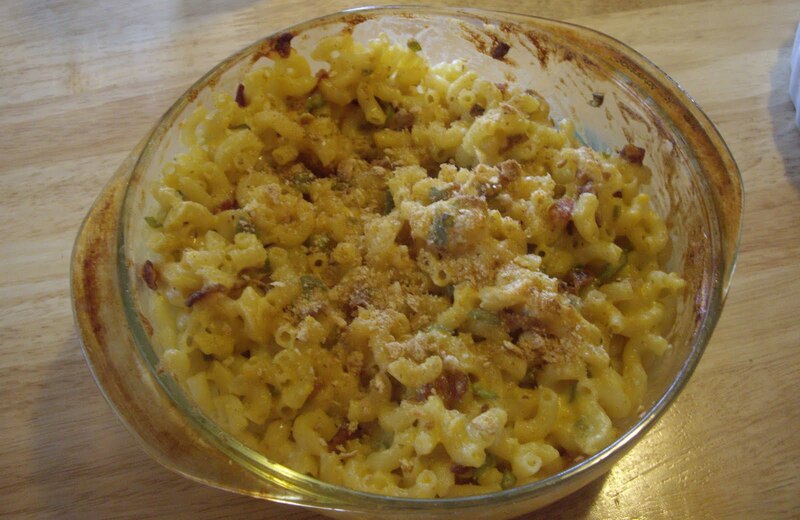 Transfer the macaroni, peppers, and most of the bacon to the casserole. Pour the cheese sauce over the top and stir everything together. Over the top, sprinkle the remaining bacon and bread crumbs. Bake for 30 minutes or until the mac and cheese is all bubbly and hot.